Don’t let age fool you — DECORATOR may be young, but the music is far from naive. DECORATOR is a full-forced wrecking ball of collaborative rock ‘n’ roll cleverly mixed with proper and contagious pop hooks. Hailing from Los Angeles, the band create a live atmosphere of energy that mirrors a heavy mixture of Foxy Shazam and Bruno Mars. 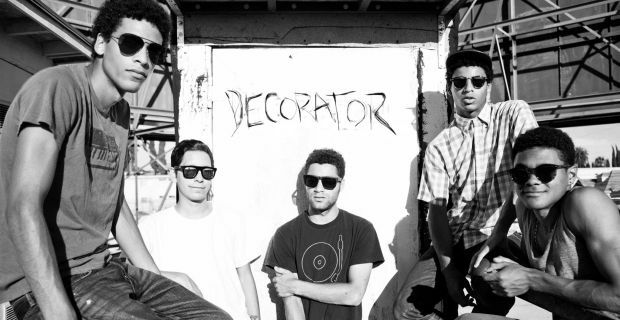 With members ranging from 19 to 21, DECORATOR are perfecting a smooth and flamboyant sound years before their competition. The band had a chance to sit down with Under The Gun during their recent trip to SXSW to talk about the upcoming full-length record, their unforgettable live show, and how their age isn’t holding them back in chasing their dreams of becoming successful musicians. What’s up, guys? Thanks for the time today. You just finished your first set at SXSW, how was it? Reece Melendrez (bass): It was awesome. We haven’t had a show like that in LA in a while. People who were walkin’ by were coming in. It was just awesome. How does it feel to start with an empty room and then have a packed house jumping up and down by the last chorus? Cameron Johnson (drummer): We’re used to that by now, you have to get used to it. We’ve played to a lot of empty rooms. Alex Melendrez (guitar/backing vocals): It’s very reassuring. It’s a great way to start the week. We never think of it that way, but it’s great. So, tell me more about you guys and what your band is about. CJ: Well, we just changed our name and rebooted our whole project. This is kind of our ‘unofficial’ kickoff. CJ: This is our maiden voyage! What influenced the name change? RM: I think it was because of how difficult it was to get our old name to stick. We’re evolving and changing. Miles Melendrez (vocals): Quite frankly, when we all started our project, we were just kids, ya know? We were just having fun in a garage together. When we changed our name we realized this is what we’re doing. This is our career. You guys are one of the younger bands at SXSW, but you’re still standing out. How does that feel? CJ: It feels good. It feels like we’re doing something right. It’s very humbling. The best thing is when you start playing stages with bands that are so good. It’s exhilarating, it’s what pushes us. You covered “Movin Out” by Billie Joel today. Why’d you pick this song? AM: I was driving and I heard “Movin Out” on the radio and I just got goosebumps. I hear songs I love all the time, but it’s rare when I hear a song that I think we would play really well. MM: It’s something we could add our twist to and people still recognize as a good song. AM: Yeah, the song had a good vibe to it and it didn’t seem out of place. DECORATOR has a very polished sound. What are your writing influences right now? AM: Just about everything! On the drive here, we listened to almost every single genre there is. Country and techno were probably left out, but everything else, man. Alternative, hip-hop, jazz, you name it. MM: Yeah, listening to all the different music helps us stay different and stand out a little bit, I think. AM: We still try to keep it poppy at the same time. RM: I don’t think we really have to try, though! AM: Yeah, we all have a pop bone in us. So, where are you pulling from lyrically? I heard a lot of stand-out lines today. AM: Lyrics come from me and Alix, but sometimes everyone pitches in. RM: Yeah, me and Cameron never sing, but sometimes we’ll help, like say, “hey that lyric doesn’t make any sense,” we all throw in our two cents. MM: Everyone throws in their opinion on someone’s part, ya know? So, like, no one gets to just get away with writing what they want. We’re always working together. We all want to like what we’re putting out. RM: I think that’s the best part of working with five people; you’re putting something together that one person, individually, couldn’t do. You’re putting in so much input and so much influence and so much feedback and what is created is this beautiful blend of five different creative minds. CJ: We’re going to be hitting the studio, so keep your eyes peeled and your ears out. What can we expect on the record? CJ: Good driving music, good party music.